Welcome Visitor. Please Login or Create an Account. This new version of the M75-FM features black tubes for a discreet all-black appearance. APRIL OFFER: Orders received for a complete Black M-Series Folding Mount during the month of April 2019 will receive a free mount carry bag included at no extra cost. Please note that complete mounts are only available via direct contact (email or telephone), to ensure that the correct frame clamps and tube lengths are supplied in each case. A lightweight version of the highly popular standard series Locking Side Folding Mount. The mount can be folded down to the side of the wheelchair when not in use or when removed from the clamp assembly making it more compact for transport or storage. 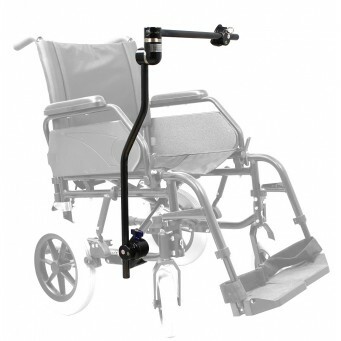 Ideal for mid-size devices up to 2.5kg, it is available with a choice of either the standard M-Series quick release base (MQR75) or any of the M-Series articulating quick release bases (AQR75, AQR75-1H or AQR75-2H). As with all M-Series mounts the Frame Clamp is supplied with locking mechanism as standard. Same design as the standard Locking Side-Folding Mount (DTSFM). Folds from in front of the user, down to the side of the wheelchair. Suitable for most standard wheelchairs. Fits either side of the wheelchair. Locking mechanism makes it suitable for chairs with tilting seat systems. Available with choice of M-Series Quick Release Base: Standard (MQR75) or Articulating (AQR75). The AQR75 is also available with either 1 or 2 optional handles to aid adjustment (AQR75-1H or AQR75-2H). Supplied with Daessy Frame Clamp Inner Piece to fit specific wheelchair. Different lengths of vertical and horizontal tube available if required. Suitable for devices up to 2.5kg. * Components listed above are for standard configuration. Exact components may differ slightly to meet specific requirements. We ask for details of the Wheelchair the mount is intended to be used with in order to ensure that the supplied Frame Clamp is correct for that chair. If you have any questions, or wish to discuss custom requirements, please don't hesitate to contact us. Copyright © 2014 Mounts & More Ltd. All rights reserved. Website Design by Flamingoat Ltd.